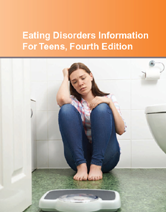 Eating Disorders Information for Teens, 4th Edition, explains how to recognize eating disorders, their diagnosis, and treatment; and provides guidelines for relapse prevention. Facts about medical consequences, co-occurring conditions, and other diseases that may be complicated by an eating disorder are also included. A special section reports on healthy weight management and exercise plans. Chapter 22—Health Consequences Of Eating Disorders. Chapter 34—Could I Have A Mental Health Problem? Chapter 41 —Types Of Therapy For Eating Disorder. Chapter 45—What Should You Really Eat?